Hyundai Motor India Limited (HMIL) launched the much awaited Grand i10. The launch marks the global debut of Grand i10 in India. customers by offering high standards of quality, durability and reliability. It offers an ideal urban mobility with a complete package from style to performance creating a new benchmark in the Compact High Entry Segment. We expect Grand with its excellent value proposition and its unique features, will serve wide range of customers in India," said B.S. Seo, Managing Director & CEO, HMIL. The Grand will be available with two engine options the 1.1-litre advanced second-generation U2 CRDi diesel and 1.2-litre Kappa Dual VTVT petrol offering a combination of optimum performance and best-in-class fuel economy. The advanced second-generation U2 CRDi diesel delivers 71 ps @ 4,000 rpm of maximum power and 16.3 kgm @ 1,500-2,750 rpm of peak torque with best-in-class mileage of 24 kmpl (ARAI figure). This environment friendly U2 CRDi diesel engine is Euro-V ready with low emission and NVH levels. The U2 engine operates at a high pressure of 1,800 bar and generates high low-end torque resulting in lesser gear shifts in city driving conditions. The linear power delivery and flat torque over wide range of rpm's ensure smooth and jerk free drive. The diesel engine is mated with a 5-speed manual transmission offering higher driving pleasure with enhanced fuel efficiency and refinement. The all-aluminum 1.2-litre Kappa petrol engine comes with Dual VTVT mechanism delivering optimum engine performance with 83 ps @ 6,000 rpm of maximum power and 11.6 kgm @ 4,000 rpm of peak torque with best-in-class mileage of 18.9 kmpl (ARAI figure). The petrol engine offers the choice of 5-speed manual transmission and automatic transmission. Grand has been designed at Hyundai European design centre in Germany using design cues of Hyundai's globally acclaimed 'Fluidic Design' theme. The Grand has been developed for the Indian market to cater to the needs of the evolved Compact High Entry buyers who values, style, space, economy and technological features. 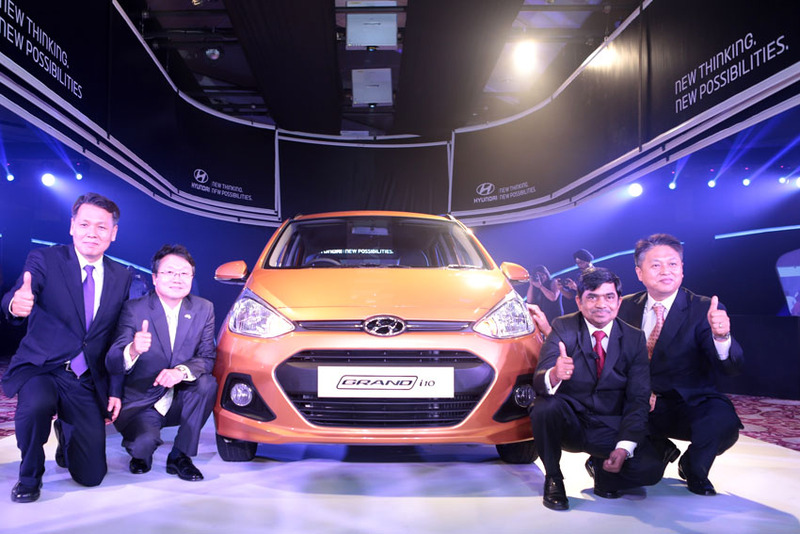 Hyundai Motor India Ltd. and Hyundai Motor Company Namyang R&D Engineers have worked closely from the conceptual stage to the final product development. The Grand showcases a modern, sporty, trendy and progressive styling. The slopping roofline along with integrated roof rails gives a sporty and aerodynamic feel while the elongated sharp headlamps, sleek wraparound tail lamps and segment unique 2 tone diamond cut alloy wheels lend a premium and sporty feel to the Grand. The interiors of Grand instill a wide sense of space with high quality fit and finish. To address the space related needs of the Indian customers the spacious cabin of Grand offers generous legroom, ample head room and shoulder room along with large boot space. The two-tone beige and black interior gives premium and luxury touch to the interiors of Grand. To suit the requirements of the Indian customers there are some India specific developments carried out on Grand. Dimensionally Grand is longer and has larger wheelbase compared to its European version to cater to the space related need of Indian customers. For enhanced comfort of the rear passenger the Grand offers first-in-segment rear AC vents which also ensures efficient all round cooling. Moreover, the rear window design on Grand is wider to avoid claustrophobic feel for the rear occupants. The Grand offers host of advance and hi-tech features like smart key with push button start and stop for keyless entry/exit and ignition on/off, auto folding outside mirrors which automatically opens and folds when the car is unlocked and locked. The tilt steering offers the most comfortable driving position while the cooled glove box keeps the beverages and food items cool & fresh. The Grand offers unmatched audio experience with integrated 2-DIN music system with first-in-segment 1 GB internal memory to store and play music of choice. It offers Bluetooth, USB and Aux-in connectivity for unlimited music access. Moreover, the steering wheel has audio, bluetooth and trip meter controls for enhanced driving pleasure. Hyundai has always led the way when it comes to ensuring safety and security of passengers. The Grand is packed with an array of active and passive safety features for the occupants. It is equipped with dual airbags, a passive safety feature which acts as a supplementary restraint system, to reduce injury risk in case of frontal impact. The ABS (Anti-lock Braking System) ensures effective braking and prevents possibility of wheel lock-up during panic braking. Grand also offers central locking, engine immobilizer and rear-parking sensor for enhanced convenience and easy parking. Grand i10 will be available in eight exciting new colours.